I know that summer well into the rearview mirror and we’ve just now returned to our comfy abodes. Time to start working on those projects to fix up the interior of the domicile. But this can also be the perfect time to start planning changes to the look of your house’s exterior. Yes, the first flakes may not have fallen yet but why wait until spring? If you start now, you can take a little time, now and then, experimenting with various concepts. Have an idea for what would be a phenomenal landscape for the yard? Two weeks later, you may not be so hot on your original concept. Or your significant other may poo-poo your idea from the get-go. Start now, no rush. And If you’re thinking of selling your house soon, one of the most important items that you must focus on is curb appeal. Another reason to get an early start. Fortunately, there’s a piece of software that will help you visualize what you have in mind. This way you can see if your idea looks as good in a picture as it does imagined in your mind. iScape apps is available for the iPad, iPhone, and iPod Touch. There is a plethora of images to experiment with, from various plants and ground cover to architectural features such as walls and pergolas. The array is impressive. From various plants and ground cover to architectural features such as walls and pergolas, the array is impressive. To use it is simple. 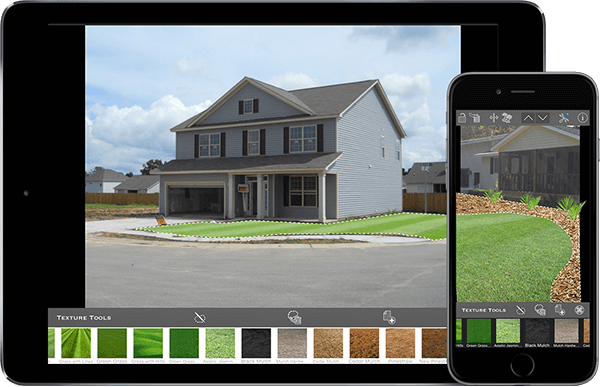 Start by taking a snap of the area(s) of your yard that you want to transform. Then by scouring the database of images, double tap the item that you want to place in your design. which will then automatically be added to your base image. Once placed inside your image, you can position it where you would like it, adjust its height and/or width and change its overall size. The great thing, of course, is that you can experiment till your heart’s content without straining your back or spending a dime (unless you make any in-app purchases). It’s on the iPad where iScape shines. There you can clearly see your changes, all of the items in the database and easily access all of the tools available to you. You’ll be able to test out ideas and see your results much more readily, plus in finer detail. Once you learn of all the features that are available to you, you’ll be surprised at just how much you can accomplish. Simply tap on the Information icon in the top right corner of the screen and you’ll be presented with a number of slides that instruct you on how to use the app. When done designing your landscape, you can share your design via email, Message, iCloud Photo Sharing, Pocket, etc. . I found that sending yourself an email of the completed design your best option, as it generated a list of the names of the various items you used (and that you’ll now have to purchase) to make your vision a reality. If you want to save your completed landscape to ‘My Designs’, you have to purchase that particular feature. But some of the in-app purchases can save you money. As an example, if you download the free version of the app, you purchase only the packages of images (Deciduous Trees, for example) that you plan on using. • iScape – this version of iScape includes a database of images; USD $9.99. • iScape Free – this version allows you to try the full version of iScape App for free; In-App purchases are offered for individual categories in case you do not want the entire iScape Database (image packages range from USD$1.99 – USD$4.99. 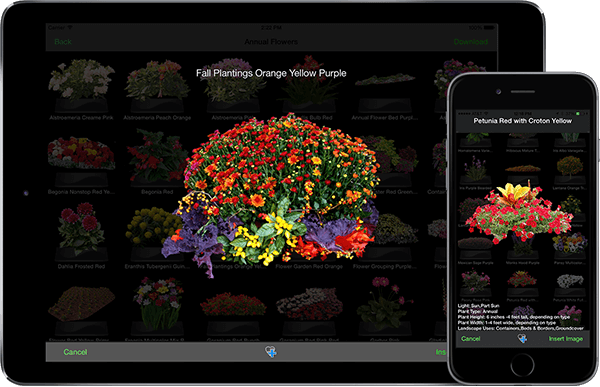 • iScape Elite – for everyday gardeners and professional landscapers; designed for the iPad; free but requires an auto-renewal subscription to obtain access and any newly added features; price ranges from USD$4.99 to USD$49.99 depending upon length of the subscription that you chose. To view the differences between the two higher end packages, I recommend that you go to their website where you can look at the various pricing structures and the extensive list of what extra features you get in the upper tier purchase. Support consists of Forums, FAQs, a Facebook Fan Page, a demo video and more. That should keep you pretty well covered. Seeing that the holiday season is coming up soon, this could be the perfect present for the gardener/landscaper in your life. You could send your loved one to sleep Christmas night with visions of conifers in their heads.